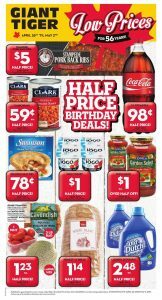 “HALF PRICE BIRTHDAY DEALS” has started in Giant Tiger stores ! They celebrate their 57th anniversary with wonderful opportunities for you ! Everything can be found here from fruit to home products, from basic kitchen foods to apparels at lower prices. A lot of specials for this week are waiting for you to be discovered here ! When you browse their product list , you will be surprised because of their amazing prices. 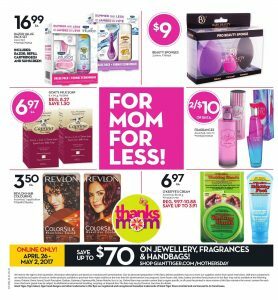 If you are ready , let’s check what you have on Giant Tiger Flyer April 27 2017 ! LOW PRICES FOR 56 YEARS ! On this article , I will try to give you some details about unique options to reduce cost of shopping. 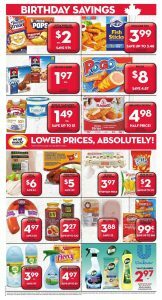 This flyer is full of perfect prices. You have various chances to pay less for your essentials. “Cheap product is poor quality” is a cliché in their stores. They always bring you the best you deserve every week. If you want to have the best and you pay less for them , you should always be alert with their flyers and their special sales. Anyway , let’s look at the best offers of them ! Not only foods and kitchen needs , there are many fashianable apparels , home essentials , some electronics , beauty products , outdoors and more. Also , some special products for the Mother’s Day are on sale now ! As I said , everything you can imagine are featured on this great flyer. I recommend that you focus on their stylish dresses for women’s. You will be satisfied when you buy their products. In addition , savings up to $70 on jewellery , fragrances & handbags are available. For more details , you can browse on page 10. If you want to see more selections and details , let’s check other pages of this. Here you go !